Brute-Force-Hack is in every way a criminal card. At first glance it may seem a rather difficult value proposition, spend X and to force the corp to spend X (and no clicks) the next time you run. And if the corp has plenty of money that's pretty much it, you drain some corp money while draining your own money at the same rate. But that's not how criminals play. Criminals like to be rich and keep their opponent poor and in such a situation Brute-Force-Hack works very well. The big weakness of criminals as a faction is breaking ice. Criminals are good at getting around ice but not so much at getting through them. Once the corp has rezzed a few pieces of ice accesses for Account Siphon and Temüjin Contract become much harder. That's where Brute-Force-Hack comes in. It's a card designed to stretch the opening phase of the game where the runner has the upper hand. The basic idea is that you first get the corp poor with things like Account Siphon and once they rez ice that you cannot get through easily use Brute-Force-Hack to derez it. How annoying is this for the corp? 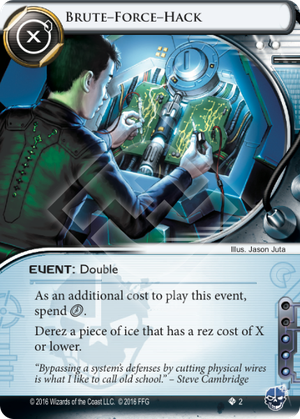 Well, assuming 4 cost ice (which is about the lower end of the scale for ice with any real chance of stopping the runner) a Brute-Force-Hack means either spending 4 to rez again in the runner's next turn or allowing the runner to free accesses. If the corp wants to stop the runner and the corp is poor that probably (i.e. absent a few cards like Beanstalk Royalties) means clicking for credits. Clicking for credits in order to rez ice you've previously rezzed is of course highly inefficient and gives the runner time to build up their game state. If the corp can afford the rez (i.e. the corp has 4 or more) it still means some of the money needs to be reserved, possibly frustrating plans to rez assets or advance agendas. If the corp doesn't intend to rerez the runner gets cheap or even free accesses. And of course there's always the risk of an Account Siphon which would make financial prudence look foolish. When evaluating these options as the corp it's important to keep in mind that the runner knows the now-derezzed card and can thus identify from the corp's credits whether or not they can rez. Similarly it's important as a runner to understand that it's best to use Brute-Force-Hack if the corp has less credits than needed to rez the ice again. If the corp needs to draw credits and does so that's a sign they want to prevent accesses, an important hint if the corp knows what's in the server (e.g. HQ, a remote or archives). If they don't that means they evaluate their existing plan as being more important than the risk of losing agenda's. That's good to know as well. Ice is expensive or impossible to break. Brute-Force-Hack both relies upon and strengthens the standard criminal play style and it's in-faction. Because of this synergy I expect it to become a common card in criminal decks.